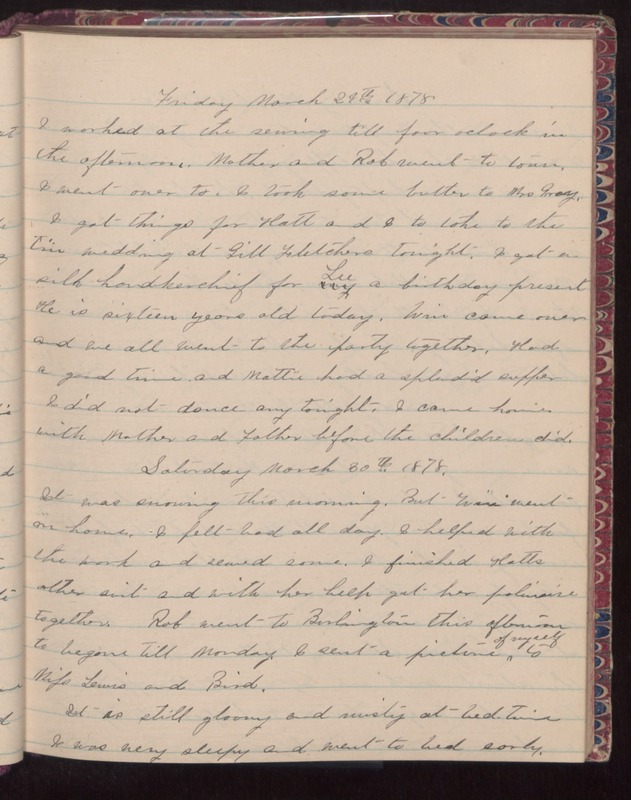 Friday March 29th 1878 I worked at the sewing till four oclock in the afternoon. Mother and Rob went to town. I went over to. I took some butter to Mrs Gray. I got things for Hatt and I to take to the tin wedding at Gill Fletchers tonight. I got a silk handkerchief for Lee a birthday present. He is sixteen years old today. Win came over and we all went to the party together. Had a good time and Mattie had a splendid supper. I did not dance any tonight. I came home with Mother and Father before the children did. Saturday March 30th 1878 It was snowing this morning. But Win went on home. I felt bad all day. I helped with the work and sewed some. I finished Hatts other suit and with her help got her polinaise together. Rob went to Burlington this afternoon to be gone till Monday. I sent a picture of myself to Miss Lewis and Bird. It is still gloomy and misty at bedtime. I was very sleepy and went to bed early.